I always place a piece of parchment paper in between the outside ring and the bottom piece to ensure easy removal from the pan, and wrap the bottom with tin foil to prevent any leakage! Use good quality milk or dark chocolate in this recipe — a plain, solid chocolate bar is good enough! Avoid using chocolate chips if possible. 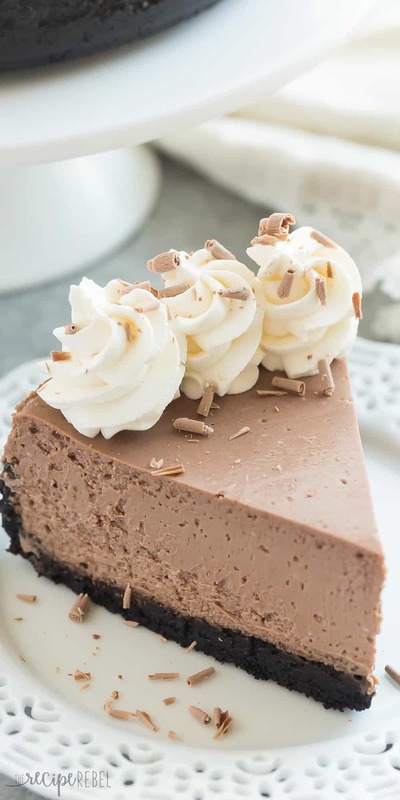 This is the BEST Chocolate Cheesecake! It's perfectly rich, creamy (with the help of Greek yogurt), and bakes up with no cracking and no water bath needed. This is the easy way to perfect baked cheesecake! Preheat oven to 325 degrees F and line a 9" Springform pan with parchment (place it in between the top and bottom sections and close around it -- this will make it easier to remove). Lightly grease the inside of the pan and wrap the bottom in tin foil. Combine butter, chocolate crumbs and sugar and press into the bottom of the pan and 1" up the sides. Remove to a wire rack on the counter, gently run a knife around the inside of the pan and let cool to room temperature. Refrigerate until completely chilled (I like to chill overnight). Carefully remove the outside ring. Slice and serve. You know I'm not really one for rules, which is why I love this no water bath method. I've often baked this cheesecake in the evening, forgetting how long it takes to bake, being forced to move it to the fridge before it's cooled completely. It is just fine! Just place on a pot holder or wire rack inside the fridge and loosely cover with foil or plastic wrap. Approximately how long does it take to cool to room temperature? Started baking later in the evening and forgot about additional cooling time. Thanks! I usually try to leave it on the counter a couple of hours before refrigerating. I’d love to hear how it turned out! 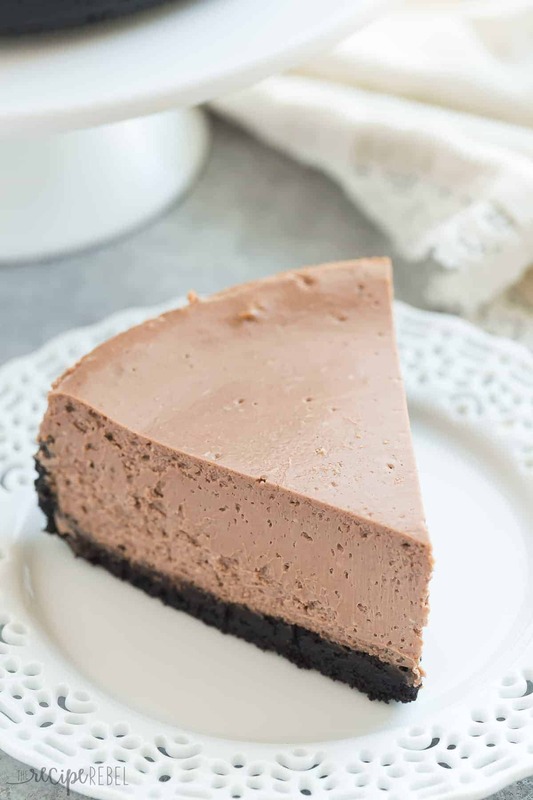 I am so glad that I found an easy recipe for chocolate cheesecake. Well I am from Holland en I don’t exactly know how 1/2 cup is in grams. Can you help me out with that? I would love to make this cake! Tasted too much like Greek yogurt. Will try again using more cream cheese and less gree yogurt. We don’t find that it does, but you are free to swap some out. Using additional cream cheese will result in a heavier cheesecake, so just be prepared. If you’d like to counteract the flavor of the yogurt more, you could use a touch more sugar or milk chocolate. Thanks Kathleen! I’m so happy to hear everyone enjoyed it! Would you be able to share the metric measurements as well? I know from other recipes that converting from US cups can always be a bit tricky. Usually semisweet — milk chocolate is too sweet for me! Ashley I followed the recipe but my cake collapsed. Any idea why? What can I do so this doesn’t happen again. Is it pretty soft in the center? My only guess would be that it was not quite done, but it could have something to do with elevation as well. For years I’ve suffered from a serious chocolate addiction I inherited from my mom. (She would love that I use her as my excuse to eat chocolate)!! 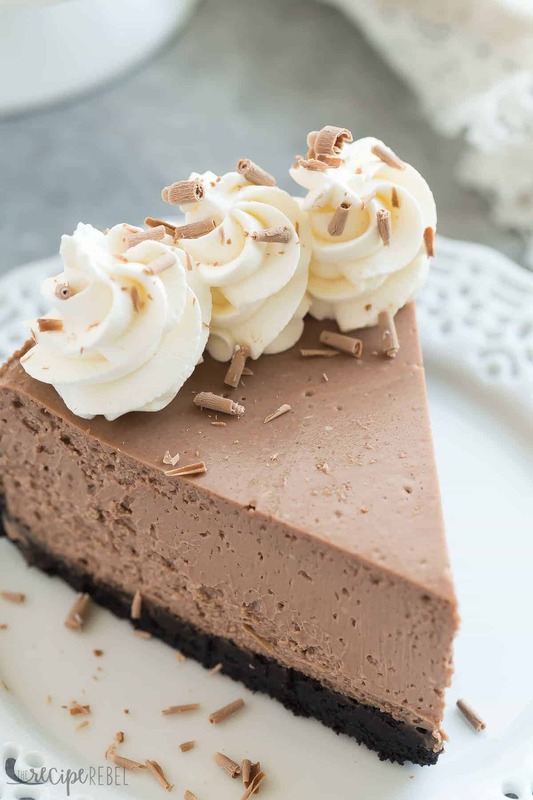 When using whipped cream to garnish your cheesecake add cocoa powder with a little powdered sugar to the cream and a teaspoon of chocolate extract for an even more decadent dessert. Do I spread the Oreo crust on top of the bottom lined with parchment paper? I just can’t picture it. I was wondering if adding a tablespoon or two of cornflour or plain flour would help in the binding of the cake, as a reviewer was mentioning about the cracking or wouldn’t it make much difference? Recipe looks really nice and I cant wait to try but since I don’t have much experience in baking cheese cakes just wanted to check with you on this. Thanks for your swift reply Ashley. i will follow the recipe for now . Just one more question- I can half the recipe if I want to (for a small cheese cake) and the results should be the same ? No problem! I have never halved the recipe. I imagine the results would be the same if the depth of the cheesecake is the same (too shallow and it will be dry), and the bake time will likely be less. 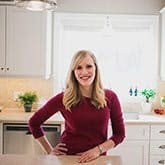 Dear Ashley, I have a convexion oven, how much bake time and what temperature would I need to use. I am having this problem with all baking recepies, because I don´t know the conversion factor for convection oven. Thanks a lot. i was wondering if adding a table spoon or two of cornflour or plain flour would help in the binding of the recipe, since a reviewer was complaining about cracking of the cake. The recipe looks very nice and would love to try but since I am not into baking cheese cakes so just wanted check with you before trying it out. Hello i am making chocolate cheescake and i want to know after its baked , i must wait until its almost cold and then place it in refrigerator ? It is sweet but also tangy, it’s not overly sweet for a cheesecake, no. The important thing when baking is to look at the bake time but also the visual signs of doneness — don’t just remove the cheesecake when the time is up. Look to see that it is set on top but with only a slight jiggle. I’m wondering if the oven temperature might be off? I had this problem too but I think it’s because I didn’t know when I should remove the sides of the springform pan and it must have been too soon. I removed it after taking it out of the oven. Perhaps I should have waited until it had chilled overnight in the fridge? It completely fell apart. Added a little creme de menthe and what a great result. I’m baking this today for tomorrow’s Christmas lunch with the boyfriends family. Cheesecake is always a favourite!! I’m looking forward to presenting your chocolate cheesecake as the first thing I’ve baked/cooked for the in-law family!! Thank you so much! I’d love if you came back to let us know how it turned out! Ashley, as this is a creamier cheesecake filling, do you think it will support the weight of me flooding the top with cranberry sauce? I’d like to serve it for Christmas. Absolutely, vanilla yogurt works perfectly! This was amazing. Made for the first time for my 15 year olds birthday. I knew I could trust your recipe to turn out without a practice run. Loved by the birthday girl and everyone else! Yay! So happy it turned out for you and was enjoyed by everyone! And making it again for #16! In the oven now … I dropped some Rolo pieces onto the top of the batter – and plan to drizzle some caramel sauce on before serving. Hopefully it turns out as well as it did last year! That sounds delicious! I hope it turns out well for you guys! I have to admit that I was skeptical about mailing this without a water bath, but I went for it anyway and I’m so glad I did ! It is truly scrumptious. I used sour cream instead of the Greek yogurt because that’s what I had. I also only had 2 cups instead of the 2 & 1/2 cups it called for but it came out fine. Did not have any cracks at all. just make sure you cook it the whole 2 hours. I took it out a little early and started to cut around the edges and noticed it started to crumble so I put it back in. You can tell when it’s done because it pulls away from the sides of the pan. Just the right amount of tang and just the right amount of chocolate ! 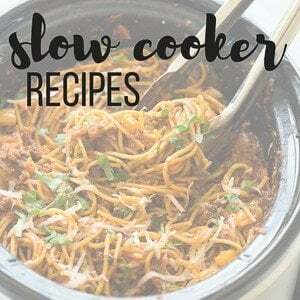 I highly recommend this recipe ! I meant to say “making this” not nailing this ! I’m so, so glad to hear that! It’s one of our favorites! I just pulled this cheesecake out of the oven and it has H shaped crack in the center. I followed the recipe to a T. May have to cover it in a white chocolate ganache. I am so disappointed….hopefully it will taste good. Did you run a knife around the edge as it cooled? I’ve made it several times and have never had any issues with cracking. Sorry to hear that! This looks amazing I’m going to try this tomorrow . Did u blend the whole Oreo for the crust or take out the filling ? I just made this tonight….had a hard time finding chocolate crumbs at the grocery. Removed most of the vanilla center from some chocolate sandwich cookies and blended them in the Ninja…. I used chocolate baking crumbs as the recipe states. Just crumbs, no filling. I can’t find the baking crumbs. When you say to use chocolate cookies in their place, do you mean like Oreo’s? If so, do I need to remove the white filling before crushing them? If you can’t find the baking crumbs I would recommend finding a plain chocolate cookie and crushing them. Do you think a chocolate graham crust such as Keebler would be okay? It should be, although the whole filling recipe will not likely fit and you’ll have to adjust your baking time significantly. How much is two & half cups in ounces? I find at the dollar store of all places the chocolate animal crackers. Grind them up in the food processor. I used the entire Oreo in the food processor. And used the entire package til completely dusted. I used the 1/3 cup melted butter as recommended. This made enough crust to go up the sides of my 9 inch springform and it was beautiful when I removed the ring. I did not add the sugar to the crust as the recipe stated. I figured the crime in the middle replaced the sugar. It was perfect. I couldn’t find baking crumbs either. When I make this I am going to put a little orange extract in the crust and garnish the whipped cream with candied orange rind. Maybe peppermint extract in the crust and crushed peppermint garnish. Oh my at the possibilities! Thanks for the odeas. I want to make this Wednesday to bring to thanksgiving on Thursday. Should I refrigerate it over night? Is it just as good the next day? I haven’t tried so I can’t say exactly. I’m going to try this today but I’m wondering, you say the result is good without a water bath but will it be even better if I use the water bath method? I mean, I’ve never made cheesecake without a water bath and I’m anxious it won’t be as good, lol. 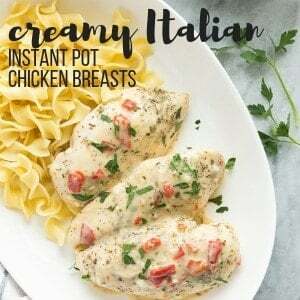 The recipe is designed to be baked without a water bath. It’s very smooth and luscious and not dense. A water bath may add more moisture than is needed and it may fall apart. I took your advice and made this without using a water bath and it turned out great! Thanks! The only thing I might do different next time is to use sweet chocolate instead of semi sweet. I just prefer sweeter as a personal preference though,everyone else thought it was the perfect sweetness. Can I make this w/ out chocolate??? What can I use to substitute for the heavy whipping cream? 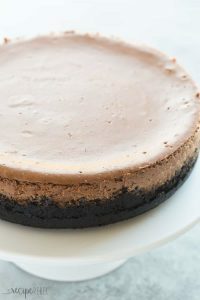 I have to say OMG 🙂 This recipe is amazing, I love chocolate cheesecake but who doesn’t 😀 Thank you for sharing this delicious dessert with us. For the base, if the ‘chocolate crumbs’ chocolate biscuits? Is the Choclate sweetened , semi sweet or unsweented , thanks ! I use dark chocolate but you could use any, depending on your tastes! So I have to say this Cheesecake was a hit!! I should start by saying I have never made cheesecake before but I was asked to make one for a family gathering. I did a test run with it and everyone at work LOVED it! I had people from different departments coming to get some as they heard how good it was! I used dark chocolate with Sea salt and then did not add the pinch of salt the recipe calls for. Will definitely be making this again!!! Thanks Megan! I’m so so happy to hear that! What is your recipe for your homemade whipped cream you put on the top? It looks thicker than just whipping cream and powdered sugar. It is just whipping cream and powdered sugar, maybe vanilla. Whip it till very stiff peaks! Looks so good! How far ahead can this be made and have you ever tried freezing it? I’ve frozen cheesecakes lots! I’ve frozen the vanilla but not the chocolate, but I can’t imagine there would be much difference. It should work great! what type of candy bar did you use? Can you use ghiradeli chocolates? And you do not use a bath? I just use a good quality solid chocolate bar. Ghiradelli would certainly work! Lindt is good too. No, no water bath required. Love to make this. Bit confused on sour cream cheese amount. Is it 2 packages of 8 oz cream cheese or total amount used is 8 oz? I have a small doubt about cream cheese. Is it 2 packages of 8 oz or total used cream cheese amount is 8 oz? Pls assist. Ashley, this is AMAZING! And your photos are so beautiful. I can’t wait to try this. Pinning!! Oh yum! 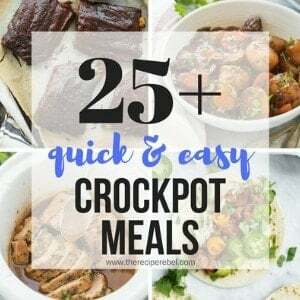 I’ve been looking for the right cheesecake to test out in my instant pot… this may be it! Oooo let me know how it works! It certainly looks like the best cheesecake to me! 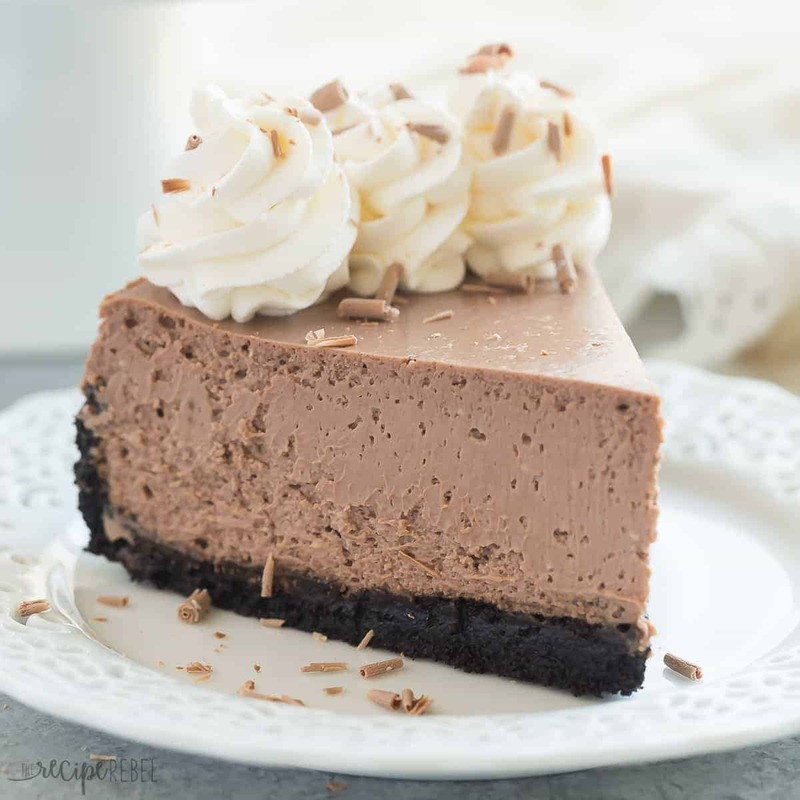 I don’t think I’ve ever had chocolate cheesecake and that needs to change — this looks irresistible! Thanks Sarah! I had to try a few times (aw shucks!) but I am SO happy with the results! I love using greek yogurt in cheesecake! It’s one of my sneaky baking tips to keep things lighter. I could sure go for a slice of cheesecake right now, chocolate is the best kind!